Attendees at SXSW Interactive were young digital marketers, at the early stage of their careers. 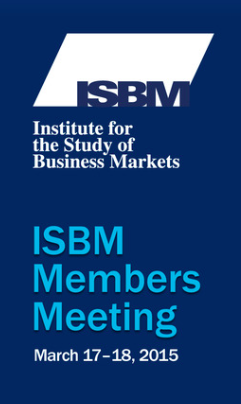 The ISBM crowd was comprised of mostly senior-level executives with 20 to 30 years of experience working for established companies. Marketing is a tech wonderland. I had the chance to wander the event floor at SXSW, marvel at all of the new technologies, play with new apps, as well as attend a couple ofsessions by new tech vendors. The theme of the ISBM event was Analytics & Analysis, and I got more than my fair share of data analytics, business intelligence, econometric modeling … you name it. If you still think that half of your marketing budget is wasting away, but you don’t know which half, you’re behind the times. Analytics and dashboards are foundational. I saw a great presentation by Dell, which showed how the company has now mapped buyers across the buying process, complete with understanding their needs, time spent at each stage and how to optimize the experience. Likewise, Wesco and Teradata shared a wonderful journey of how Wesco put into place the tools needed to become a data-driven marketing group, enabling the company to tie its activities to business outcomes, or in this case, revenue. From what I heard and saw, companies have built the foundation to pull, analyze and report marketing performance data. Some have even made the leap into forecasting and predictive modeling. Investment is still a challenge. A thread ran through the ISBM event concerning the challenge of securing the funding to buy new marketing tools and/or staffing teams. Despite several speakers presenting solid case studies with clear ROIs, they were still challenged with getting the support and funding needed to continue making progress. Is there a lack of organizational acceptance and/or appreciation of marketing insight and activities? The question that popped into my head regarding the funding challenge was, “Are marketers able to make the business case in a way that makes executives want to fund their request?” The other issue was marketing’s ability to communicate effectively across the organization based on it s culture. One speaker, Bill Rozier from Ciena, provided insight into how to do it effectively. Bill created a lead generation report in an easy to understand PowerPoint slide. As Bill said, “The sales team has to be able to get all the information they need in 30 seconds or less, or we’ve lost them.” Since Bill’s new report launched less than two months ago, lead reconciliation rates have gone from 13 percent to over 70 percent. Is there, or will there be, a communication gap between the “Hoodies” and “Blue Blazers”? It’s not necessarily a generational one, although there is that. Rather, it’s one based on what they view to be important and valuable. I saw some great social media tools at SXSW that provided deep insights into audience engagement and buyer intent. But close to half the marketing executives at the ISBM meeting had revenue targets, and almost all had lead targets. It made me think that there may be, or may soon be, a potential communication issue between the digital-savvy “engagement and intent” crowd and the “lead and revenue” veterans. From what I saw, there is still work to be done to close the gap between social media results and the connection to key performance metrics valued by marketing executives. Will marketing overplay analytics? Perhaps my biggest concern reflecting on the week is twofold. In business-to-business companies with strong product (and engineering) cultures that are empirically driven, will the utilization and reliance on new marketing tools and data limit an organization’s creativity, and/or innovation? The second concern has to do with organizations where marketing feels like they are under attack. Will marketers use their new reporting capabilities as a defense mechanism, hiding behind the data, instead of using it proactively to provide the organization with new insights and opportunities? Despite these and other questions still weighing heavily on my mind, I did reach two solid conclusions. The first, Austin is by far the best food-truck town in the United States, and the second is that Tampa’s weather is the salve for the burn of the harsh Northeast winter — a point brought home to me as I returned from Tampa just in time for our first-day-of-spring snowstorm. Twenty-five years ago, I was a snot-nosed kid out of college who suddenly decided that law school was not in the future. With a recession on, and needing to pay the rent, I took the first job offered and went into sales. Having learned nothing about the profession in college, I picked up a copy of Miller Heiman’s Strategic Selling — still have a dog-eared copy on my bookshelf. I learned everything I could about the buyer types, account management, and the sales process. “Know the process work the process,” as my first sales manager used to say. Typically, that process came down to 5-to-7 steps that generally covered the following areas below. Over the years, I found that working the process helped give you sense of control. It came down to the numbers; calls, leads, transaction sizes or conversion rate. Call on X number of qualified prospects to get Y amount of proposals, at Z close rate, and you made bonus. But, research from Google and CEB entitled The Digital Evolution in B2B Marketing provides new insight into buyer behavior, and it challenges the conventional wisdom. According to the study, customers reported to being nearly 60% through the sales process before engaging a sales rep, regardless of price point. More accurately, 57% of the sales process just disappeared. What are buyers doing if they’re not talking to sales? Well, they’re surfing corporate websites to identify and qualify vendors, instead of the sales forces qualifying them. They are engaging peers in social media to learn more about their needs, potential solutions, and providers. And they’re reading, listening to, and watching free digital content that is available to them at the click of a mouse. No longer is the sales force the sole source of information. The study recommends focusing efforts in three areas; 1) improve marketing communication integration, 2) develop and activate a content strategy, and 3) strengthen multichannel analytics. Nothing new or breakthrough here, but the study provides good examples of how companies are executing against each point. However, I found a number of other points to take from the research. It is not all bad news – for products or services with low price points and/or margins, having customers self direct themselves through the sales process can help reduce the cost of sale and/or create leverage for the sales force. In fact, in certain situations an organization will want to encourage and/or incent this behavior. The research also found that some customers felt comfortable going through 70% of the process before making contact. Changing buying behavior – an old manager used to say that technology changes fastest, then consumer buyer behavior, and eventually, organizations. The “57%” stated in the research makes for a good sound bite; the fact is, that number will vary, greatly by customers, transaction, industry, etc. The point is that change is a constant; the question is how far ahead or behind is your sales and marketing efforts? Are you keeping pace? The second question is, how would you know? Content Distribution – as the study notes, the sales force is still the most effective and important communication channel. When developing the content strategy ensure that the best and/or most valuable content is not in the public domain, reserve it for the sales force. Time to Take Social Media Seriously – with well-informed prospects, sales reps have to quickly learn what buyers know or perceive about the organization, products/services and competitors. Social media can help them better understand what is motivating buyers to take action, what buyers believe to be true, and perhaps most importantly, who they believe. Business decision makers will continue to drive their buyer process deeper into the sales process. As a result, relevant content will continue to escalate in value, especially content related to consideration and purchase drivers, and the business application of the product or service. For sales, the research may be an epiphany. No longer can it be successful focusing solely on an inwardly directed process intended for reporting and planning purposes. Finally, it is time to recognize that we’re not in control, and perhaps we never were. The traditional sales process is now obsolete; it is now time to follow the buyers’ journey.